A fire at a pub in Peterborough yesterday was caused by “discarded smoking material”, according to the region’s fire service. Three fire crews were called to O’Neills in Broadway at 3.12pm on Sunday (October 22). 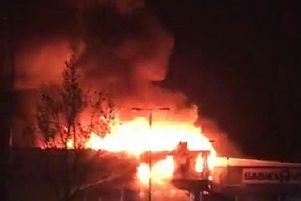 The road was shut for more than two hours as firefighters pulled wooden cladding off the pub to get to the source of the fire, while staff were also seen leaving the premises. The building was heavily smoke logged when the fire crews from Dogsthorpe, the Peterborough Volunteer Fire Brigade and Market Deeping arrived. Wearing breathing apparatus they extinguished the fire using a hose reel and had returned to their stations by 6.30pm. A spokesperson for Cambridgeshire Fire and Rescue Service said the fire was accidental.